Get suggestions on what numbers to choose for the next draw. Learn how to create wheeling systems of the best 20 numbers, print your tickets directly on lottery bet slips. 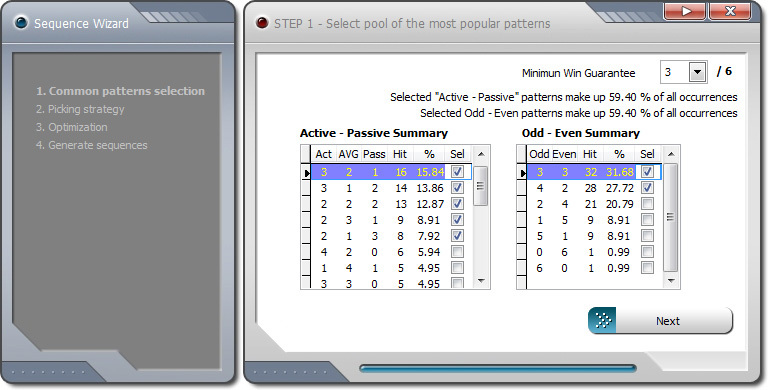 LOTTOmania uses advanced statistical analysis to select the most popular winning patterns consisting of active, average and passive numbers. Its build-in Suggested Sequence Wizard lets you to select the best strategy for the next draw. It works with all lotto-type lotteries that draw 4-9 numbers out of a number pool from 1 - 99. LOTTOmania is extremely easy to use for even a beginner. All tools in one package for lotto players!